Vietnamese Prime Minister Nguyen Xuan Phuc has an aspiration to utilize Artificial Intelligence (AI) to build a civilized and prosperous Vietnam, taking this great opportunity for Vietnam to become a pioneer. Under the direction of Prime Minister Nguyen Xuan Phuc, Minister of Ministry of Planning and Investment (MPI) Nguyen Chi Dung led a delegation of MPI’s leaders to study in the United States, and on April 23, 2018, the delegation worked with the Michael Dukakis Institute for Leadership and Innovation (MDI) and the Boston Global Forum (BGF) to discuss and propose MDI to advise the development of an AI economic strategy for Vietnam. In response to the aspirations of the Government of Vietnam, MDI carried out the research and prepare report a report by Prof. Jason Furman – Harvard University, Chairman of the Council of Economic Advisers of President Barack Obama, who chaired the drafting of the AI Strategy for the US Government, and Mr. Nguyen Anh Tuan – Director of MDI, with the support of Governor Michael Dukakis – Chairman of MDI and BGF, Prof. Thomas Patterson – Harvard University and Prof. Nazli Choucri – Massachusetts Institute of Technology (MIT) and Prof. David Silbersweig – Harvard University. 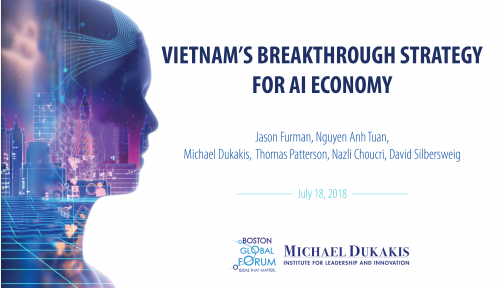 The main features of the breakthrough strategy for AI economy and specific solutions, measures for Vietnam: Becoming an pioneer in building the AI-Government and the AI Age Culture owned by the Government of Vietnam, attracting intellectual elites in the Boston area, attracting fundings from the World Bank and the United States, establishing a leading country in automatic governance by AI, then building an AI Innovation Zone which has the ability to provide advanced products and services for Vietnam and international markets, helping Vietnam to become one of the advanced and leading countries in AI. It is hoped that the Government of Vietnam will find here useful suggestions and recommendations for the development of Vietnam’s AI economy, making Vietnam move forward to go with the civilized and advanced countries in the field of AI.